1.1 What is chicory coffee? 1.5 Is chicory coffee good for everyone? It is also sometimes added as an additive to the same coffee. Chicory coffee has also been used to adulterate coffee and as a coffee substitute in times of economic hardship. In India, South Africa and southern United States it is used more than the true coffee. To prepare chicory coffee use the suitable chicory plant (Cichorium intybus var. Sativum). The root is dried, roasted and ground to become powder that is used to make a tea like coffee. 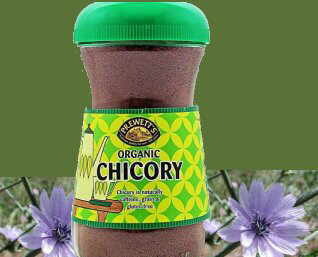 The root of chicory contains mainly inulin (10 to 15%). Inulin is a complex carbohydrate sugar composed of fructose. Once ingested, inulin is slowly releasing blood sugar so it is suitable for the diet of people with diabetes to keep blood sugar levels constant. Inulin is also considered a type of soluble fiber which makes it suitable for constipation and for the absorption of toxins in the intestine. In addition to inulin, chicory root is rich in intibin, a bitter principle with cholagogue properties. That is, intibin stimulates bile production, which opens the appetite and helps digestion in lazy stomachs, which usually are been subjected to indigestion. We must not forget the vitamin and mineral content of chicory root, which include minerals such as potassium, phosphorus and calcium. It also contains B vitamins. This root is rich in essential fatty acids as interesting as linoleic acid (Omega 6) and alpha-linolenic acid (Omega 3) These unsaturated fatty acids counteract other saturated acids such as palmitic acids, of which the root has a considerable amount. The root also carries palmitoleic acid, a monounsaturated fatty acid. Coffee is primarily a stimulant. Chicory can be considered a digestive and a regulator of the bowels. The two types of coffee have diuretic properties and stimulate urine production. But the way they use to do it are very different. Coffee stimulates because caffeine increases cell metabolism. Chicory contains a set of principles (magnesium, calcium, potassium, fiber, apigenin, vitamin C, etc.) that increase diuresis without affecting the nervous system. Both, coffee and chicory, possess antioxidant properties. We can say that the chicory has a lot of the benefits of coffee in a more moderate and without the negative effects of caffeine. Is chicory coffee good for everyone?